Oxford Historical Treaties (OHT) is the premier resource for historical treaty research and home to the full text of The Consolidated Treaty Series, the only comprehensive collection of treaties of all nations concluded from 1648 through 1919. The centenary of the Great War in 2014 has generated impressive public as well as scholarly attention. It has all but overshadowed some other major anniversaries in the history of international relations and law, such as the quarter-centenary of the fall of the Berlin Wall (1989) or the bicentenary of the Vienna Congress (1814–1815). As with the turn of the year the interest in the Great War seems to be somewhat subsiding, and the anniversary of the most epic and dramatic event of the Vienna period (the Battle of Waterloo of 18 June 1815) is approaching, the commemoration of the Vienna Congress gains a bit of the spotlight. The Congress of Vienna marked the establishment of a new political and legal order for Europe after more than two decades of turmoil and war following the French Revolution. The defeat of Napoleon (1769–1821) in 1813–1814 by a huge coalition of powers under the leadership of Britain, Russia, Austria, and Prussia gave the victorious powers an opportunity to stabilise Europe. This they intended to do by containing the power of France and recreating the balance between the great powers. At Vienna, between November 1814 and June 1815, the representatives of more than 200 European polities – many from the now-defunct Holy Roman Empire – met to debate a new European order. The Congress of Vienna stands in the tradition of great European peace conferences, beginning with Westphalia (1648) and continuing with Nijmegen (1678–1679), Rijswijk (1697), Utrecht (1713), Vienna (1738), Aachen (1748), and Paris (1763) to the Paris peace conference that ended the American War of Independence (1783). Yet, in several ways, it was also a departure from it. At the prior peace conferences, the major order of business had been to agree on the conditions to end war and restore peace. Whereas this implied discussions on the future order of Europe, the major interest was to settle the claims that lay at the origins of the war and the focus was thus largely backwards-looking. In the case of Vienna, peace had already been made between France and the major allies before the conference met. Peace had been formally achieved through the First Peace of Paris of 30 May 1814. This peace had taken the traditional form of a set of bilateral peace treaties between the different belligerents. In this case it concerned six peace treaties between France on the one hand and Britain, Russia, Austria, Prussia, Sweden, and Portugal on the other hand. These treaties were identical but for some additional and secret articles. Professor Parry published the treaty between France and Britain as well as these separate articles (63 CTS 171). On 20 July 1814, France concluded a seventh peace treaty with Spain (63 CTS 297). Article 32 of the identical treaties provided for a general congress at Vienna to ‘complete the provisions of the present Treaty’. The peace treaties contained the major conditions of peace, including the new borders of France. It was left to the Congress to lay out the conditions of the general political and legal order of Europe for the future. Not even the return of Napoleon from Elba and the eruption of new war diverted the Congress from its forward-looking agenda. The congress was not suspended nor was a new peace treaty made at Vienna. After Napoleon’s defeat at Waterloo and the second restoration of the Bourbons to the French throne, a new set of peace treaties was made under the Second Peace of Paris of 20 November 1815 (65 CTS 251), between France and each of the four great powers of the coalition. Numerous other powers later acceded to the peace. As prior conferences had done, the Vienna Congress produced a whole set of – mostly bilateral – treaties. But the conference also chose an innovative form for its closing as its main conclusions were formally laid down in a general instrument, the Final Act of Vienna of 9 June 1815 (64 CTS 453). This act was signed and ratified by the seven powers which had concluded peace at Paris on 30 May 1814, with Spain and some other powers later acceding. Article 118 of the Final Act incorporated 17 treaties which had been concluded at Vienna and annexed them to the instrument, thus committing all signatories of the Final Act to them. In turn, Article 11 of the Second Peace of Paris would later confirm the Vienna Final Act, as well as the First Peace of Paris. As it is generally established in the scholarly literature, the new order of Europe which came out of the Vienna Congress was based on two main pillars. 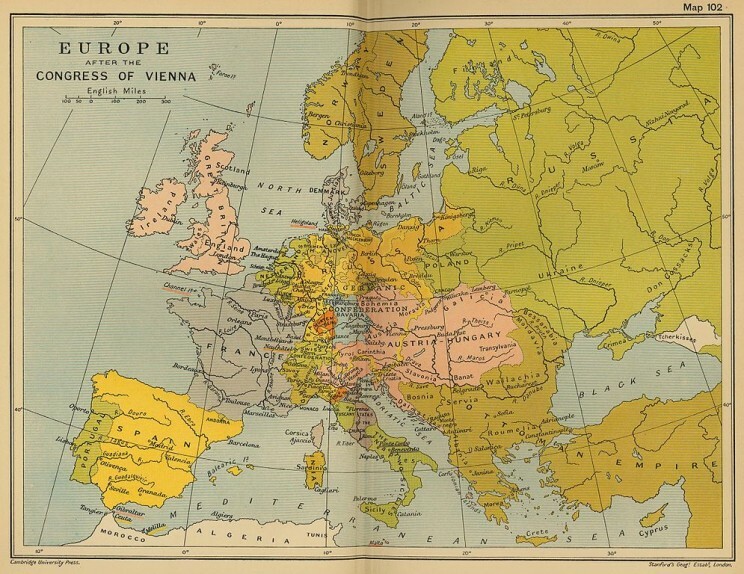 Firstly, the Vienna powers aspired to restore and safeguard the balance of powers and made this into a leading maxim in drafting the new territorial map of Europe. This was done by reducing France to its borders of 1792 – allowing it to keep some of its conquests from the Revolutionary Period – and strengthening its neighbours. The greatest riddle to the balance of power was the future of Germany. The solution was found somewhere between the extremes of a return of the division of the Holy Roman Empire, which would have made it defenceless against new French expansionism, and its unification, which would have disrupted the balance of Europe. The new German Confederation would contain only 39 states instead of the over 300 of the old Empire. Within the Confederation, a balance was created between the two leading powers, Austria and Prussia, both of which made considerable territorial gains to ensure their capability to contain France, and each other. Secondly, the Vienna order was built on the principle that the great powers – a group into which France retook its traditional place – would take common responsibility for the general peace and stability of Europe. The four victorious great powers had already agreed on this principle in different instruments prior to the Vienna Congress, the main one of these being the Treaty of Chaumont of 1 March 1814 (63 CTS 83). This ‘great power principle’ also determined the organisation and working of the congress itself. Although over 200 delegations were present, the major negotiations and decisions took place in the Committees of Five (Britain, Russia, Austria, Prussia, and France) and of Eight (also including Spain, Sweden, and Portugal), relegating the other powers to roles as lobbyists for their own interests. As the chief French negotiator, Charles Maurice de Talleyrand-Périgord (1754–1838) had it, ‘Vienna was the Congress that was not a Congress’. The Final Act did, however, lack a provision for the future implementation of the great power principle apart from the fact that the eight great powers were bound to all its provisions and thus were all guarantors of the territorial and legal order of Europe as laid down in the act. This was remedied by the Second Peace of Paris of 20 November 1815. Article 6 of the bilateral treaty of alliance signed between Britain and Austria provided for the convening of conferences between the great powers to discuss matters of common interest and the maintenance of peace in Europe. Through its incorporation in the identical peace treaty, this committed all its signatories. The basic features of the reorganisation of Europe from Vienna would survive for more than five decades, until the German unification. Whereas Europe was plagued by numerous armed conflicts and wars, the Vienna order proved at the same time sufficiently grounded and flexible to allow the great powers the leeway necessary to prevent these wars from escalating into a new general war. Even the disruption of the balance of power through the defeat of France in the Franco-German War and the ensuing unification of Germany in 1870 did not lead to an end to the endeavours by the great powers to manage the system and to sustain peace. The breakdown of the peace and the total conflagration of 1914–1918 destroyed the credit of one of the pillars of the Viennese settlement, the balance of power. But the other survived. Even more so, the idea that the best guarantee for order and peace was their joint management by the great powers became the backbone of the institutional organisation of collective security in the League of Nations in 1919 and the United Nations Organisation in 1945. Headline image credit: Congress of Vienna. Public domain via Wikimedia Commons.